Elm Street gets all the glory as Theater Row, but what about Pacific? It had those very same theaters. …Sort of. Pacific gets overlooked a lot. When I see photos like this one — which shows Pacific Avenue looking east from Bryan — I always think of it as a photo showing the back side of Elm rather than as a photo showing Pacific. Always a bridesmaid, never the bride. This photo was taken only a few short years after the Texas & Pacific railroad tracks were removed from Pacific, making it into an automobile and pedestrian thoroughfare only — no more frightening, smoke-belching trains rumbling right down the middle of the street. The city was hoping that Pacific would become a heavily commercial area like Elm, Main, and Commerce, but it never really reached those lofty heights. I’ve always wondered if the theaters that lined Elm ever considered having entrances/box offices on both Elm and Pacific. I think that they were really only willing to slap a few posters and paint their names on their back, Pacific-facing walls. Elm Street was glitzy and glamorous. Pacific was not. Back in those early days when people were still trying to get used to Pacific Avenue being newly liberated from its railroad tracks, it might have been seen as something of an afterthought — as more of a very wide alley with traffic than as a contender for one of Dallas’ major streets. But back to the theaters. 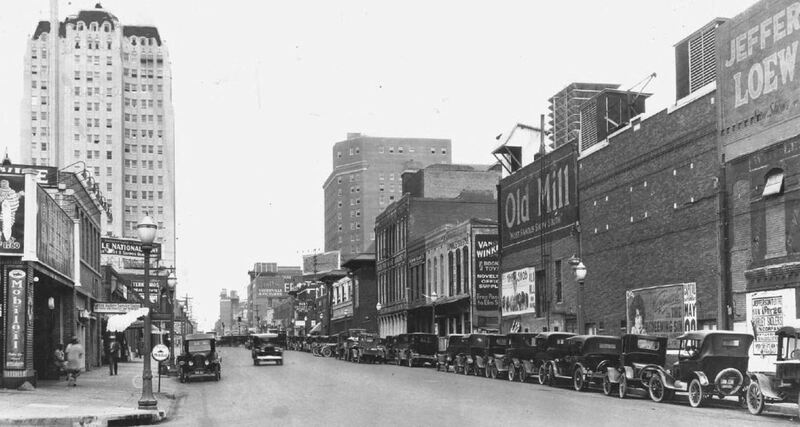 In the photo above, we see the Old Mill at 1525-27 Elm (where “The Snob” was playing, featuring John Gilbert and Norma Shearer), the Capitol at 1521-23 Elm (which had Alla Nazimova in “The Redeeming Sin”), and the Jefferson Theater at 1517 Elm (featuring Harley Sadler’s repertory company appearing in “Honest Hypocrites and Saintly Sinners” between vaudeville acts). All of these were playing in May, 1925. It’s interesting that the only business seen here on the south side of Pacific that had an address on both Elm and Pacific was Van Winkle’s Book Store (before it moved a couple of doors up Elm, it was at 1603 Elm/1614 Pacific). Note the sign advising “Free Passage to Elm Street” — several businesses allowed people to cut through their stores to get to the next street over because the blocks were incredibly long and would sometimes have necessitated pedestrians going three blocks out of their way just to get to their destination. 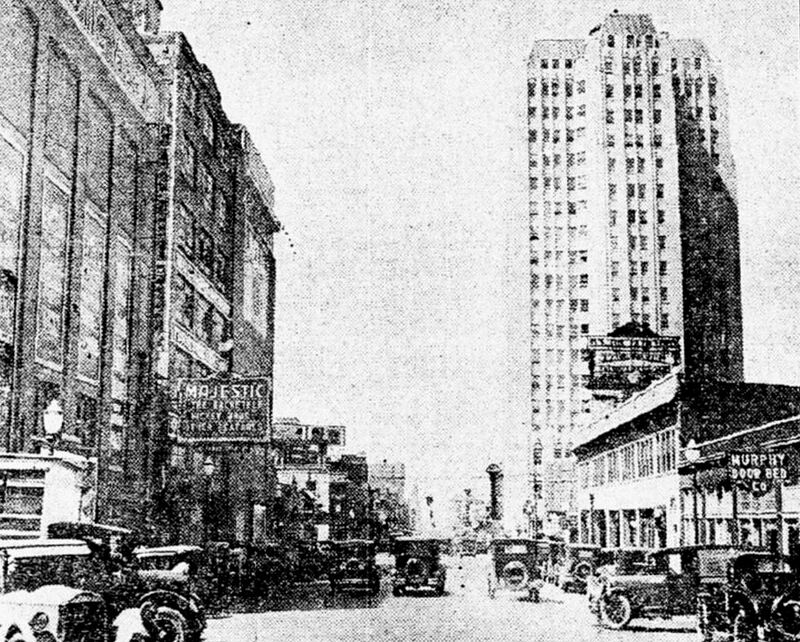 Other notable landmarks in the photo above: the Medical Arts Building (on the left) and the Dallas Athletic Club. Here’s a view of Pacific from around the same time, looking west, from about Harwood. Most interesting detail in this photo? That Murphy Door Bed Co. sign! Top photo from Lost Dallas by Mark Doty (Charleston: Arcadia Publishing, 2012). ‘I’ve always wondered if the theaters that lined Elm ever considered having entrances/box offices on both Elm and Pacific. ” probably not since the Pacific side was where sets and other items for the theaters were delivered. Great post. Didn’t the Tower Theater have an entrance on Pacific at one point? Maybe I’m confused because the original theater faced Elm, of course, and when Corrigan Tower opened in the 1950s the theater was either moved or expanded to that building. You can barely see the marquee in this photo, but it’s clearly there. If any of my fellow Norma Shearer fans might want to put The Snob in their queue it should be noted that the film most likely does not survive. Nazimova’s The Redeeming Sin is in the same boat. I always think it’s interesting that occasionally the only way some movie POSTERS survive is when they can be seen in the background of old photos like this. The old Dallas Athletic Club building was a beautiful building. I worked there as a bell boy in the early 60’s. I working there the day President Kennedy was assassinated. My buddy and I, Curtis Hoff, enjoyed our teenage years working there. Some of the best memories of my life was there. If anyone has any old pictures, I would like to see them. It was a great period to live in Dallas. Still remember some names of people that worked there during that time. Mr. Kauffman was our boss, Curtis and I gave him a hard time, all out of fun.